Open Arts: What a Scorcher! Wasn’t it just? Fabulous weather over the Bank Holiday weekend and a thoroughly successful show at Spring Bank Arts Centre in New Mills. We had a steady stream of visitors over the three days and a wide variety of artists and makers for them to meet and talk to about their work. The raffle and cake sale raised over £200 for the centre to help support this great community initiative. So who was there and if I missed it where can I see their work? I took a selection of work that showed my development as an artist from some early impressionistic oil paintings through mixed media and to my most recent abstract work. The next opportunity to meet me and see what I have been up to will be at Art in the Pen at Skipton on the 11th and 12th of August. I also have a limited number of tickets available for the preview evening on Friday 10th – email me if you would like one. First come first served! Michela Griffith was exhibiting with a selection of prints from her creative photography. Cath Dunn. 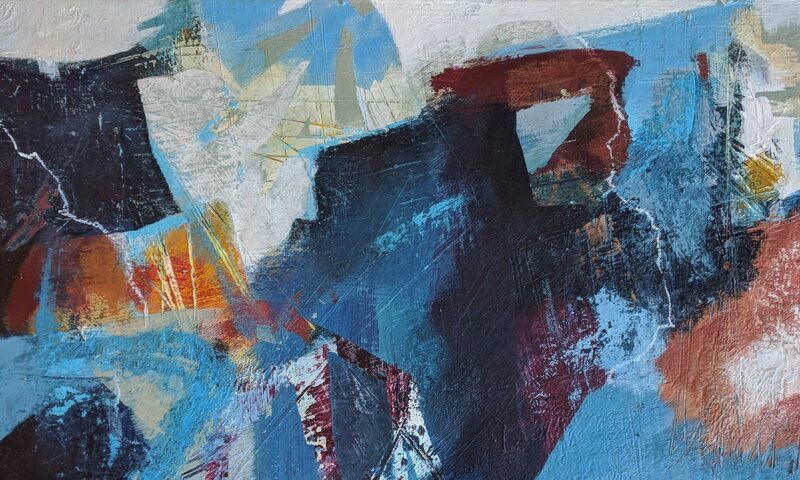 Cath paints watercolour and mixed media semi-abstract work inspired by the Peak District Landscape. Howard Levitt was also an exhibitor. Howard is a professional artist and illustrator. Our final artist and jeweller was Emma Sidwell. Pentimento , the creative partnership of Jaki and Catherine who are based in Glossop. Finally Adele Kime who not only brought a fabulous selection of her jewellery for sale but was also the main organiser for the group. Thanks Adele! We had a great time, some pretty delicious cake, great coffee (felt like an early start for one or two of us) and met some lovely folks and sold some of our work. Support for these kinds of events is invaluable for practising artists as we get to meet and begin to build relationships with people who may become collectors of our work in the future. Even purchasing something small like a greetings card helps small business owners and artists to continue. I’m reminded of the Just a Card campaign which was started with this aim. Thanks to all who came along and for some great conversations and feedback, and finally, hope to see you again next year. Next PostNext Abstract Landscape Workshop: what can you expect?